Laredo International Airport (LRD) was in a prime position to facilitate and leverage the boom, because it had equipped itself for increased cargo business by building and opening the only bi-national federal inspection station (FIS) in the United Sates. Completed in November 2012 and open for business in spring 2013, LRD's bi-national inspection station contains U.S. and Mexican Customs facilities. This allows U.S. exports such as auto parts, electronics and aerospace products to be inspected at LRD for expedited entry into airports at eight key Mexican cities: Chihuahua, San Luis Potosi, Queretaro, Guanajuato, Toluca, Guadalajara, Hermosillo and Ramos Arizpe. LRD Operations Manager Guillermo Villalobos explains that the bi-national FIS not only fosters U.S. trade, but also encourages goods bound for Mexico from all over the world to be sent through the small Texas airport. Because cargo can clear Mexican Customs at LRD, it can be released at any of the eight approved airports for delivery without pause. This, in turn, helps companies decrease production delays by reducing the amount of time it takes to receive necessary parts, notes Villalobos. To undertake such a large and unique project, LRD initiated a $200 million capital improvement plan for infrastructure and cargo growth, funded by the FAA. One of the plan's major portions occurred in 2014, with seven projects totaling $9.5 million. Key elements included replacing fences, improving the airport's baggage system, replacing the chiller, continuing in-process apron reconstruction and rehabilitation, upgrading security systems and improving parking facilities. Villalobos considers the scope "pretty incredible" for a non-hub airport. While LRD greets about 110,000 passengers annually, cargo traffic spurred the need for a new terminal in 1998, extensive runway and taxiway work, and other infrastructure improvements. Over the past 20 years, all three of LRD's runways have been reconstructed, with crews replacing pavement from the 1950s that was built for lighter aircraft. Another key component was extending Runway 17L by 1,500 feet, and more projects are in the works. "Our infrastructure must be [improved] so that it can handle the type of cargo aircraft we see," he explains. 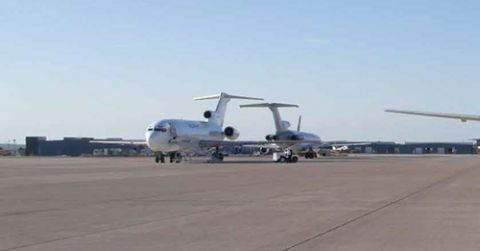 The airport's previous pavement was only about 7 inches thick, because the airfield was originally built as a U.S. Air Force Base for use by much lighter aircraft during World War II, and then subsequently transferred to the city of Laredo in 1976. Thanks to more recent improvements, the pavement now includes 17 inches of Portland cement concrete on 6 inches of bituminous base-much more suitable for the civilian aircraft using it. FedEx bases two Boeing 757s on site, and UPS an Airbus A300. In addition, Northern Air Cargo often flies two Boeing 737s into LRD from Alaska, and Everett's Air Cargo regularly operates two MD-80s. With reconstruction of nearly all existing cargo apron complete, the next main projects are extending the runway and replacing the 1960s-era FAA control tower, which Villalobos reports has reached the end of its useful life. "We don't want to go into the future with it for the next 20 years, because air traffic is so important from a safety perspective," he notes. Overall, the airport's cargo apron reconstruction plan includes 14 phases of work. Currently, teams are working on Phase 9. They also are reconstructing partial parallel Taxiway G to the primary runway and extending the Taxiway G to the north, creating a full length parallel taxiway. Chad Pennel, senior project manager at Lockwood, Andrews & Newnam reports that Phase 10-apron reconstruction on the west side-is also in the design phase. Once complete, the new apron will provide additional areas for cargo operations. Although aging infrastructure was the main reason for FAA's $200 million investment at LRD, the bi-national FIS station figures prominently into the airport's long-term strategies. Pennel says that the inspection station was a major consideration in preparing aeronautical forecasts for the Airport Modernization Plan, as it opened while the planning process was occurring. "We really had no idea what the impact of that facility was going to be on aircraft operations," he recalls. "Most of the time you can find a comparable situation, but that didn't exist." The new inspection/clearance capabilities provide a great opportunity to bring economic growth to the Laredo area and improve foreign relations with the Mexican government, notes Villalobos. Having previously served as the FAA program manager to LRD, he knows firsthand about the importance of both. When Villabos retired from the federal agency, Jose L. Flores, the airport's former manager, offered him the top job at LRD. The process of establishing a certified Mexican Customs station in a U.S. airport was no small task. "The idea was 10 years in the making," Villalobos explains. "Mexico had to pass a law to allow this to happen, and had to even amend their Constitution because it's a reciprocal service." Because there is also a U.S. Customs facility in Mexico to pre-inspect perishable products coming into the United States, a constitutional amendment was needed to allow U.S. weapons on Mexican soil at the Customs facility. Flores and U.S. Representative Henry Cuellar were instrumental in making it all happen, emphasizes Villalobos. Currently, LRD is the only airport on the country's southern border with 24/7 U.S. Customs, and it's the only non-hub U.S. airport with round-the-clock Customs processing for air cargo, notes Villalobos. As such, Representative Cuellar proudly refers to LRD as "NAFTA's cargo hub." Villalobos expects activity at the new bi-nation FIS to increase as more businesses realize the facility's capabilities, and airport staff are accumulating operations data for analysis. "It's a pilot program for everybody," he remarks. "It takes time for companies to evaluate the process and reconfigure their operations to take advantage of the FIS." Pennel agrees, noting that the full impact of the facility has yet to be realized. "It hasn't had time to develop and reach its full potential," he notes. Lockwood, Andrews & Newnam came on board as LRD's general engineering consultant in 2013, and the firm has been closely involved in bringing a string of construction and rehabilitation projects to fruition. Its personnel also help prepare overall development objectives for the FAA and provide specific cost estimating for the airport's extensive construction work. "We really have tried to fine tune those," Pennel says. "You can only be so accurate when you're just starting a project." He agrees with Villalobos that funding had to be a priority for such extensive work, and felt it was important to get a good handle on the costs early on. Lockwood, Andrews & Newnam and Ricondo & Associates worked together to develop the Airport Modernization Plan. Main components included analyzing where and how cargo operations can be expanded and providing LRD ideas for future growth. "Right now, they have two parallel runways and a crosswind runway," explains Pennel. "All their commercial traffic and terminal buildings are on the east side, and most cargo on the west." Due to physical constraints, decommissioning the largely unused crosswind runway is one of the master plan's main priorities. Doing so will open land on the west side for future development. In that mindset, the extension of a cargo road to allow access to land on the east side is another project currently in the hopper. "They've got existing aprons over there they can use as well," Pennel explains. "Then, they will have access; and it's just a matter of someone wanting to develop their facility when the time comes." Securing the necessary funds for key improvements was a vital piece of LRD's long-term puzzle, notes Villalobos. Having a plan is essential, he adds, as is being aggressive in working with consultants to prepare specifications and deliver them on schedule. "That gets you ready with the FAA to be able to receive the grant," he explains. "Here in the Southwest Region, the FAA will issue grants only when you have bids in hand, not based on estimates alone." Assembling bids and "having our ducks in a row" gave LRD a better chance of receiving discretionary funds, he comments. Pennel agrees about the importance of having a long-term plan in place and maintaining good working relationships with all involved. "The last thing you want to do is develop an area for general aviation use, and then have big cargo developers want to build a facility at that same location," he relates. "Having those broad planning guidelines will really help as you go project by project, so you're not creating a situation that hinders future development either." In general, Pennel encourages airport executives to look at the big picture-specifically how one project will impact other areas and/or create new issues. Villalobos also highlights the importance of infrastructure, stressing that cargo business will be hampered if an airport's facilities are not up to par. "The 727s are very demanding from a pavement standpoint because of the landing gear configuration," he specifies. "If you want the activity, you really need to ensure the airport infrastructure is in a condition to handle it." Strong airfield assets attract cargo business, but also improve safety and overall capacity, he emphasizes. On a larger scale, they preserve the economic prosperity of the airport in the community, he adds. On a similar note, Villalobos says forecasting and knowing about various markets are also important components of the process. "We don't operate in a vacuum," he says. "We have data that strengthens the direction we want to go." As a cargo-driven airport, LRD is playing an entirely new game than it did just one decade ago. Online business, international commerce and the increased speed of moving product have changed the way the facility must operate to stay competitive. "I'm very satisfied with the results of the years of planning and all the blood, sweat and tears that were shed while going through this," Villalobos says. "It was not easy." Looking back, he says that his cultural bond to the Hispanic community and previous experience at the FAA provided the right assistance for the FIS projects and other infrastructure improvements. "[The airport] needed a lot of tender loving care and it just blossomed," he reflects. Looking forward, he's excited about what those improvements will mean for LRD and Laredo.